I made this bag for a special friend's birthday. It's not my pattern, but it's so good that I wish it was! 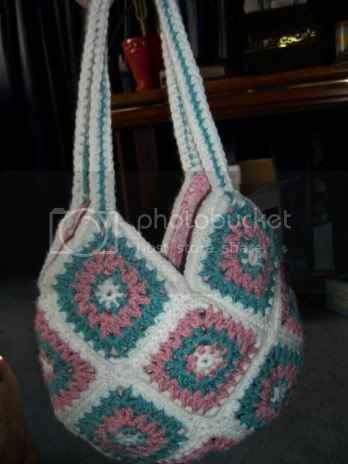 This was my first crocheted bag, and generally first bag that I've ever made, and it was tons of fun to do. I must make one for myself now! It's a free pattern and I have the PDF file for it. If anyone wants it, I can email it to you. I believe it can also be found at http://www.crochetpatterncentral.com/ titled as Tapestry Tote Bag. I made some adjustments though. I wanted a shoulder bag, so I made the bag handle longer. I also couldn't follow the instructions for the handle so I just winged it. The yarn I used for it was from Red Heart Super Saver.